Hello nesting! Why can't the rest of pregnancy be like this? I love how productive I feel, and what better time to feel productive than at the beginning of a new year? Seriously. It's the best. I am so excited about this blanket I made for little boy arriving sometime in February! 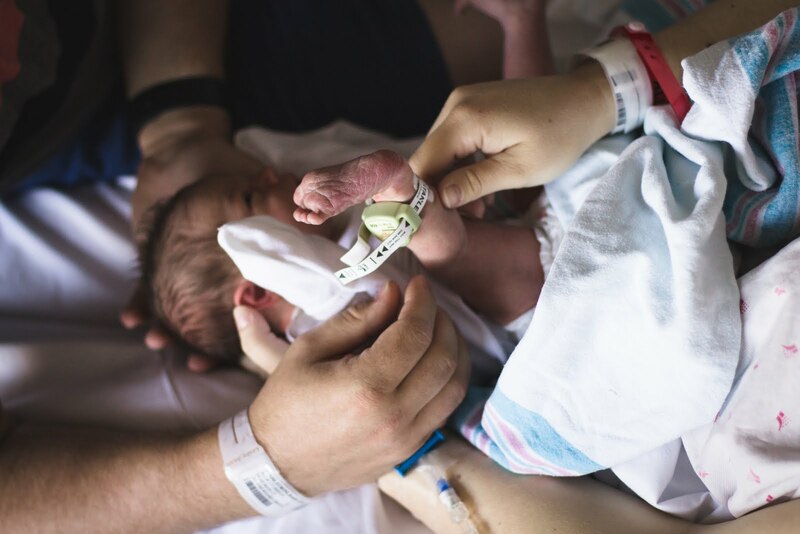 When my mother-in-law gave me a swaddle blanket for Christmas then told me that she had made it, that's when I learned that swaddle blanket fabric (cotton gauze) can be purchased from most quilt shops. I loved the one that she made for us, but you know babies... they're messy. So I needed a backup! If you're new around here, or around any of my social media interfaces, let me just tell you, I am a sucker for Pom Poms. I don't know why, I just love them. so. much. I bought the fabric from a local quilt shop, but you can also purchase cotton gauze from Joann's, Hancocks, or even Hobby Lobby (although the fabric at Hobby Lobby wasn't quite the same quality as at the quilt shop, not sure about the quality at Joann or Hancock). I bought two spools of the mini pom pom trim from Hobby Lobby (can also be purchased at Joann or Hancock), and that was all I needed! It ended up costing me around $15.00. So! The method is super easy. Ready for a tutorial? It is SO important that you do not skip this step! Depending on the quality of your fabric, it may shrink. a lot. 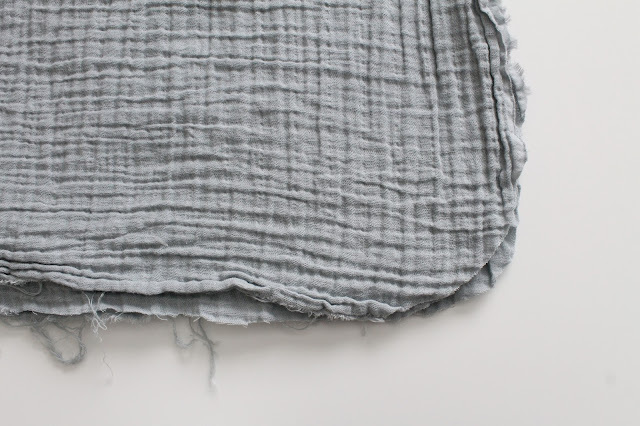 Fold your fabric so that all four corners match up and use a plate as a guide to round the corners of your fabric. *Note! 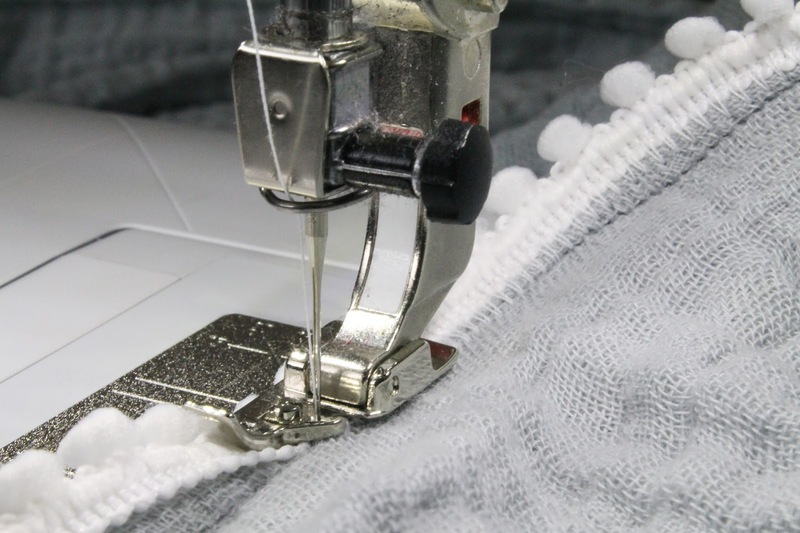 * The more gradual your curve, the easier it will be to hem! Consider doing an even more gradual curve than pictured. 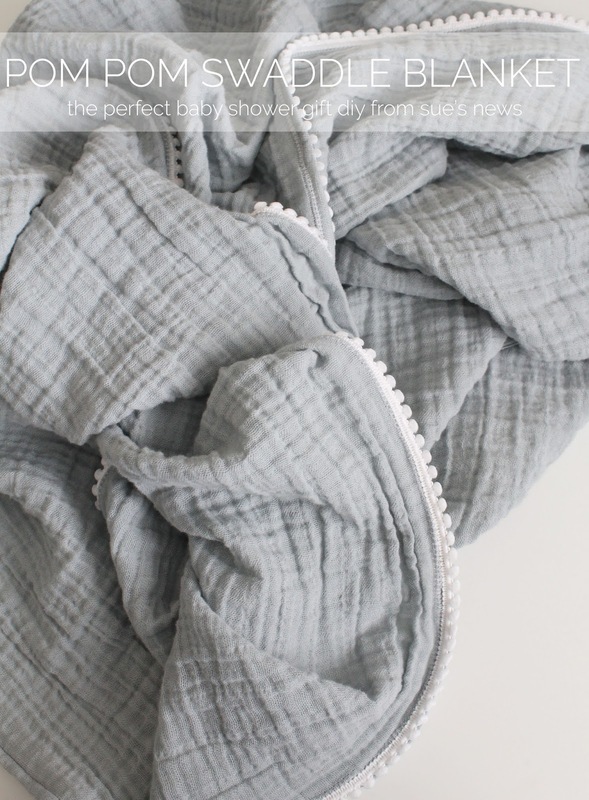 Cotton gauze frays. 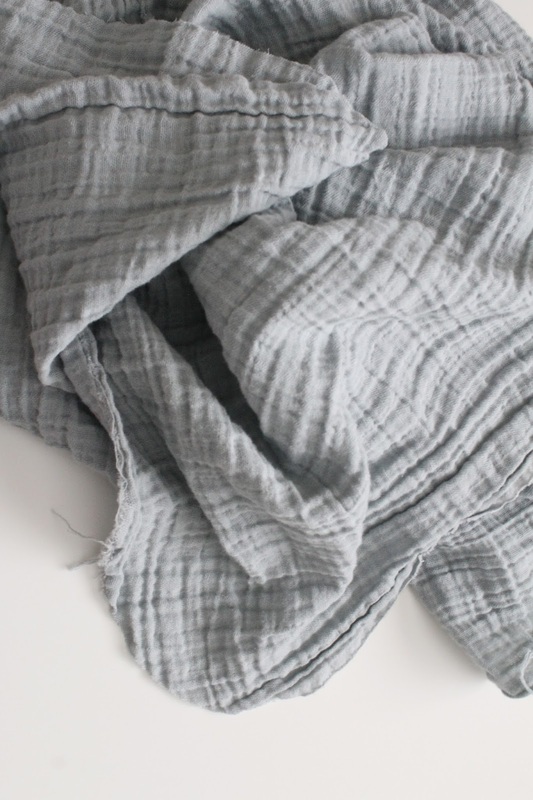 You can serge around the entire blanket (if you are one of those blessed people that owns a serger), or you can fold under the edges of the blanket twice and pin down. 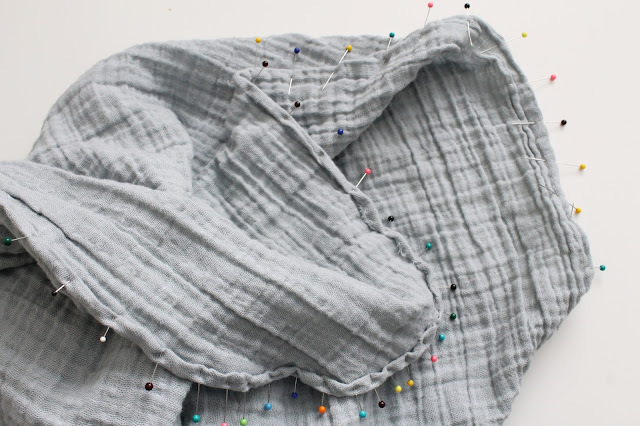 Make the hem as teeny tiny as possible. Even smaller than 1/4" if you can manage! This is where the gradual curve of the corners will really be helpful! Sew the hem down right along the fold. 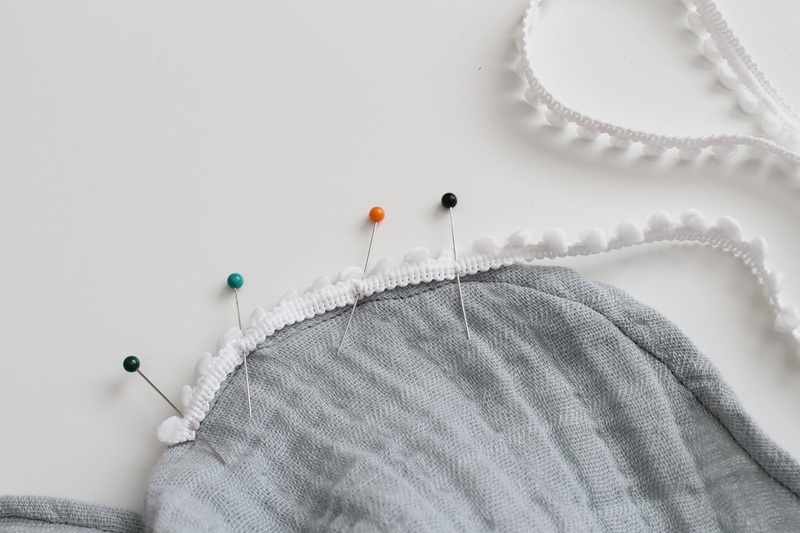 Step 6: Trim - To pin or not to pin? I started out pinning the trim to the hem line in the beginning, but eventually skipped the pinning and went straight to the machine instead. It's your choice. I wanted a stitch that kind of looked like a blind hem stitch (a couple of straight stitches, then a zig zag), but you could easily go for a zig zag stitch instead. Just personal preference. 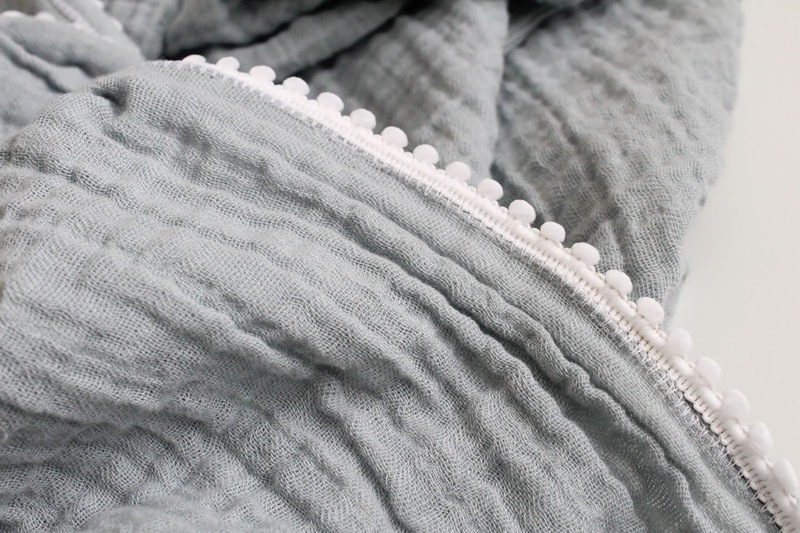 Sew the trim right along the edge of the fabric on the right side of the blanket. 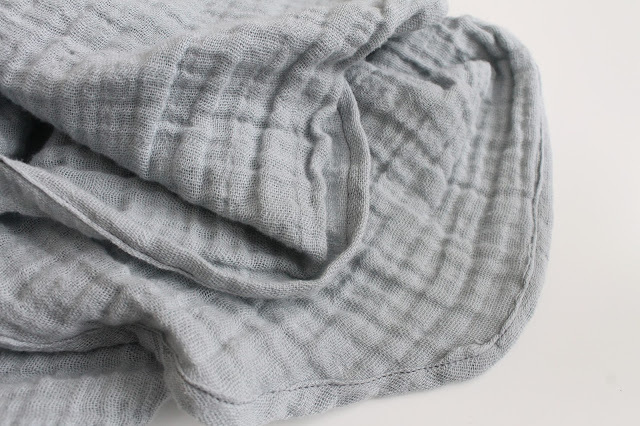 It is VERY likely that I will be making another one of these blankets. You just never know how messy babies will be. Plus, this would be SUPER cute in navy blue and white trim, don't you think? And don't get me started on how many cute, fun girl combinations you could use! I really hope some of my friends get pregnant soon so I can make more for their baby showers. This is a great tutorial, I love it! 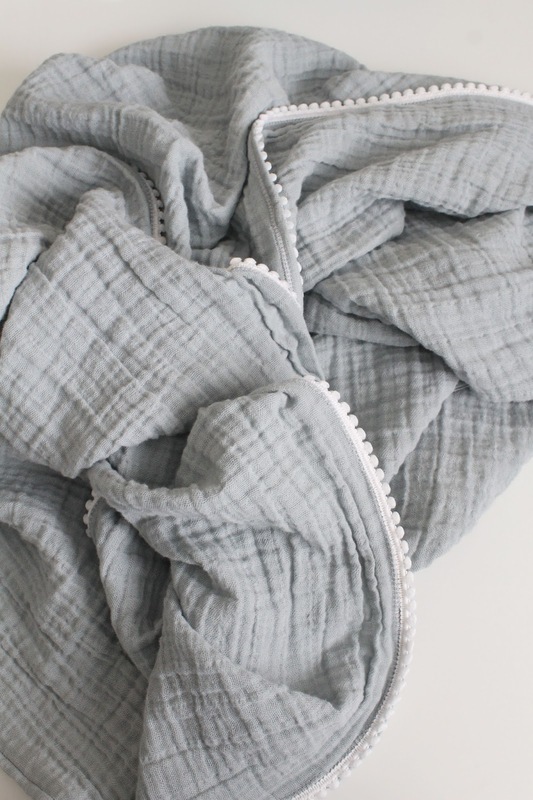 Where did you find your cotton gauze fabric? Thank you! Hi Calee!!! Thank you so much! I found my fabric at a quilt shop, so did my MIL, so I think quilt shops are your best bet! They also sell it at Joann's and Hobby Lobby. The quality is better at quilt shops, though. Oh, thank you so much! I will definitely be keeping my eye out for some good cotton swaddle/gauze fabric. I'm so excited to do a project like this! Thanks again! Send me a picture when you make one! chevronandlace@gmail.com and/or post it on Instagram and tag @suesnews Good luck! Would you use a yard of 48" wide gauze? Or are you making a 48x48 square? It's totally up to you and how big you want the blanket to be! I wanted mine to be bigger and more of a square shape so I purchased 48" of 45" wide gauze fabric. Hope that answered your question!